Waiting on Wednesday is a weekly event that highlights pre-publication/upcoming releases that readers cannot wait to get their hands on. It is hosted by Jill at Breaking the Spine. First, the cover is breathtaking, creative, and I WANT IT NOW! 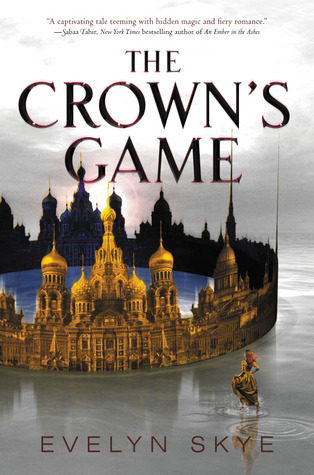 The word “crown” is in the title. I’m currently a sucker for book titles with crown or queen in them. GIMME, WHY ISN’T THIS BOOK IN MY LIFE, YET?! A Russian setting. I have an immense fascination with Russian culture, literature, and history, so obviously this book has earned 100-bajillion points to Ravenclaw! And last, the synopsis provides hints to a complicated romance that is guaranteed to make me swoon. YES, PLEASE! EEEKKK! I can not wait to continue each of these series. What sequel or companion novel are you looking forward to reading this year? It’s Top 5 Thursday, where as the week is winding down, I tell you the Top 5 Things I’m looking forward to in regards to the bookish world. In the next few weeks, I am attending ALL the YA book events my local bookstore has scheduled. I love Joseph Beth Booksellers in Cincinnati, and HOLY MOLY they are kicking up their game this year. HERE JOBE, TAKE ALL MY MONEY!!! I can’t keep up with all of this awesomeness. So this is why everyone in the bookish community has a planner, right? MY BOOKSTORE IS THE GREATEST!! Emily Henry’s The Love that Split the World on January 28, 2016 at 7:00 p.m. Ally Carter’s See How They Run on January 29, 2015 at 7:00 p.m.
Kiera Cass’s The Siren on February 1, 2016 at 7:00 p.m.
Melissa Lander’s Starflight on February 6, 2016 at 2:00 p.m.
And as a rewards member of Joseph Beth, I have already bought my VIP tickets to Marissa Meyers’ event, and I’m ready to join all the Lunartics!!! For more information on the Joseph Beth Booksellers in Cincinnati and their events, please click HERE. Will you be attending any of these events? What local book event are you looking forward to? Perfect for fans of E. Lockhart and Jandy Nelson, When We Collided is a powerful story of two teens whose love is put to the test by forces beyond their control. 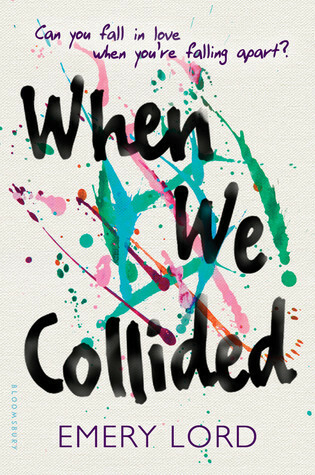 When We Collided is a very poetic and realistic, young adult contemporary that approaches many topics: fractured families, loss, jealousy, adulthood, mental illness, and the difficulty to dive into new friendships and hold on to old ones. When We Collided encompasses alternating perspectives between Vivi and Jonah. Both teenagers use their summer to explore the realities of life’s adventurous embraces, but also its severe punches. Vivi is full of life and is rambunctious at times. Her high-spirited soul and vintage-clothing-wearing lifestyle sways the reader through a pendulum of emotions—you will love her and her positive attitude—but sometimes her danger-seeking self becomes too much for both Jonah and the reader to endure. Do you ever stick your arms out and start spinning as fast as can, and in the end you’re restlessly dizzy? Vivi is that fun-loving girl that dares herself to spin and spin and spin as fast as she can. But Vivi is also that unwanted dizziness—that chaotic loss of control that you experience as you try to regain your balance and quickly make the world stand still again. I’m not going to spoil the secrets and stories that the main characters withhold from each other, but in the end, the truth is leaked and hearts are meddled with. In When We Collided, Emery Lord reminds her readers that life does not always have a happy ending, a happy beginning, or even a happy in-between; however, sometimes we are lucky to have people that insert slits of laughter and joy into our existence, and in those times, we are truly alive. RANTS: I know that all books have an ending, but I honestly did not want this book to end–it was that good. When We Collided will most definitely be a re-read for me when the hardcover is released. RAVES: Emery Lord eloquently sets up a very well-paced, heartfelt, and lyrical story for her readers. I also enjoyed the familial interactions that Vivi experiences with Jonah’s family, especially with his little sister. More importantly, I appreciated and loved how Emery effectively approaches the topics of parental loss and mental illness in a very truthful and honest manner. NOTE: I received this ARC through a book exchange with a fellow blogger/booklover. All statements and opinions are mine. “War has begun. Arin is in the thick of it, with the East as his ally and the empire as his enemy. He’s finally managed to dismiss the memory of Kestrel, even if he can’t quite forget her. Kestrel turned into someone he could no longer recognize: someone who cared more for the empire than for the lives of innocent people—and certainly more than she cared for him. At least, that’s what he thinks. GAAAAAHHHHH! You guys, my heart aches for the conclusion of Kestrel and Arin’s story. I need this novel like yesterday. If you haven’t read this series, please do yourself a favor and start it immediately. This trilogy contains duels, battles, secrets, a swoon-worthy love story, kisses, betrayal, friendships, daggers, and spies. The book release date is March 29, 2016. 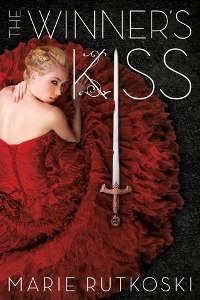 Learn more about Marie Rutkoski and The Winner’s Kiss from the publisher Fierce Reads, the Young Adult portal for Macmillan Children’s Publishing Group.